Hair loss or baldness is a genetic trait—but unlike what you may have been told, it’s not necessarily passed down from your maternal grandfather. Medical science has come to learn that baldness genes are actually passed down from both sides of the family—and they affect hair loss in women as well as men. Baldness genes may also skip generations and are utterly random in terms of which siblings (male or female) they will affect. They may even have very different effects on siblings in the same family. What causes hair loss for one member of the family may differ entirely from what causes another member’s, so it is best to not rule anything out before seeking a medical opinion. The leading cause of hair loss in men is male pattern baldness or Androgenetic Alopecia. Male pattern baldness is characterized by hair receding from the lateral sides of the forehead (known as a “receding hairline”) and/or a thinning crown (balding to the area known as the ‘vertex’). Both hair recession and hair thinning become more pronounced until they eventually meet, leaving a horseshoe-shaped ring of hair around the back of the head. Male pattern baldness occurs in men whose hair follicles are sensitive to the hormone dihydrotestosterone, or DHT. Over time, DHT-sensitive hair (usually found on the top and front of the head) becomes weaker, finer, and eventually stops growing. However, even men who experience advanced hair loss typically have healthy hair follicles around the sides of the head. Even though these healthy hairs are exposed to DHT, they are resistant to this hormone and survive for a lifetime. Although this is not the leading cause of hair loss in women, Androgenetic Alopecia is still relevant. Female pattern baldness. Hair loss in women is also related to genetics, hormones and age. It may be a serious medical condition which needs proper attention and treatment as early as possible. The hair loss patterns in women also usually differ as compared to men. Traction alopecia– It is most commonly found in people with ponytails, tight braids or any hairstyles that typically pull on hair with excessive force. In addition, rigorous brushing, heat styling and rough scalp massage can damage the cuticle, the hard outer casing of the hair. 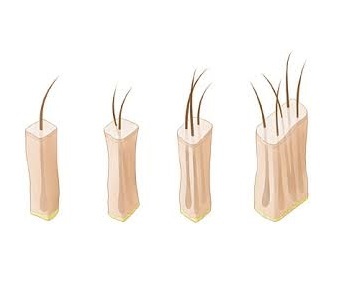 This causes individual strands to become weak and break off, reducing overall hair volume. Trichotillomania–This is the loss of hair caused by compulsive pulling and bending of the hairs. Due to the constant extraction of the hair roots, permanent hair loss can occur. Onset of this disorder tends to begin around the onset of puberty and usually continues through adulthood. Traumas such as major surgery, poisoning, and severe stress may cause a hair loss condition known as telogen effluvium, in which a large number of hairs enter the resting phase at the same time, causing shedding and subsequent thinning hair in men and women alike. The condition also presents as a side effect of chemotherapy – while targeting dividing cancer cells, this treatment also affects hair’s growth phase with the result that almost 90% of hairs fall out soon after chemotherapy starts. Alopecia areata– This is autoimmune disorder also known as “spot baldness” that can result in hair loss ranging from just one location (Alopecia areata monolocularis) to every hair on the entire body (Alopecia areata universalis). Although thought to be caused by hair follicles becoming dormant, what triggers alopecia areata is not exactly known. In most cases the condition corrects itself, but it can also spread to the entire scalp (alopecia totalis) or to the entire body (alopecia universalis). Cicatricial alopecia– This is a diverse group of rare disorders that destroy the hair follicle, replace it with scar tissue, and cause permanent hair loss. The hair loss may be accompanied with severe itching, pain and burning, and progress rapidly. In other cases the hair loss is gradual, without symptoms, and is unnoticed for long periods. It is also sometimes known as scarring alopecia and can occur in otherwise healthy men and women of all ages. Hypothyroidism(an under-active thyroid) and the side effects of its related medications has been found to cause hair loss, typically frontal, which is particularly associated with thinning of the outer third of the eyebrows (also seen with syphilis). Hyperthyroidism (an over-active thyroid) can also cause hair loss, though parietal rather than frontal. Find out how hair loss in men and hair loss in women differ in classifications. Navdeep Hospital & Hair Transplant Center, 112, Sukhdev Nagar, Panipat-132103, Haryana, India.